This morning, Yankee and I both wanted to hit the snooze button in the cabin, so we got a bit of a later start around 6:30am. We had our goal set for a 30mi day, but were pretty wiped out from yesterday. It’s been pretty hot and today was said to possibly be the hottest day of the year. Looking at the maps and elevation, we thought a big day was possible, but little did we know that we’d have a lot of distractions ahead. The day started out well with nice wooded trail and great terrain. Here is what we saw most of the day. I was happy because it was pretty hot out and it was much better in the shade. When we did get views, it was pretty hazy from the heat. In the morning, we ran into southbounders MK and JD. I met them before in Northern California where they jumped down to do a section while waiting for the snow to melt up here. It was great to see they are still on the trail and going strong. They mentioned some trail magic at a pass that would be 17mi into our day. We usually eat lunch around mile fifteen, but we decided to push it further for the trail magic. We also knew we needed to keep a schedule to make it to our destination by 7:30pm. For some reason, we didn’t ask what kind of trail magic it was and we hoped for the really good stuff. It was nice to have a mid day destination goal. The hills today were steep both up and down, and combined with the heat, that was pretty draining. We’ve come to accept that unlike the winding trails around hills or mountains in California, Washington likes to just go straight up and over anything standing in its way. The trail today had lots of fallen trees that we had to go over or around. Just before the trail magic, there was an off trail water source. I got to it before Yankee, and headed for the spring. When I got there, the section hiker known as John Deere was there. It was great to see him. He is a well known trail angel and was helping at the Saufleys when I was there. He gave me and other hikers a ride to REI. He had given Yankee a ride to the doctor too. We talked for a bit and headed another half mile to the mystery trail magic. It was fun to hear that John Deere is one of the subsribers to my journal and it was nice that he kinda knew me. The trail magic turned out to be a cooler with fruit, sodas, and Gatorade. We ate lunch there and the cold Gatorade on this hot day was great! I was the last to leave lunch and knew I’d catch up with Yankee later. The hills after lunch were really steep and more exposed. I was dripping sweat and glad to have had Gatorade. I was able to get cell reception on the first hill and took some time to post the journal, check email, and make some calls. I came by John Deere who was planning on stopping soon and continued on to catch Yankee. I came around the corner to see Yankee happily picking huckleberries as he hiked and listened to the Yankees game. He was in heaven and loving it. I’ve yet to mention the popularity and abundance of huckleberries out here because I don’t eat them. Most hikers do and it’s a big part of the trail in WA and OR, so I should probably mention it. Yankee was so excited that I quietly took a video of him listening to the game and picking berries as he hiked. I’m sure it will go down as one of his highlights on the trail and it was entertaining to watch. We had a couple final hills at the end of the day and knew we’d be cutting it close to my 7:30pm preferred quitting time. We were headed up a switchback with a couple miles left to got and someone was sitting at the turn of the switchback. He asked if we were thru hikers and the revealed that he was doing trail magic with lots of food. What a surprise! We were tired and so close to making it to camp, but we saw brownies and couldn’t refuse some trail magic. 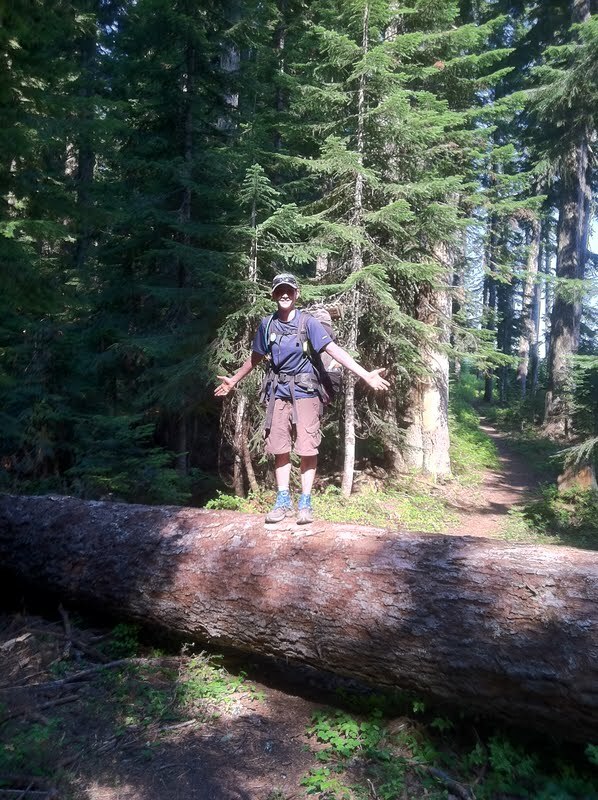 The guy doing the trail magic was named Fugitive and had done the PCT a few years ago. After some brownies, chips, salsa, guacamole, and french bread, we headed up some of our steepest climbs of the day. I found that eating a lot of guacamole and then climbing ip a steep hill in the heat doesn’t mix. However, we still made it to camp just before 7:30pm and I’m sure to sleep well tonight. Tomorrow, we will hike 16mi into Snowqualime Pass and are quite excited to spend the remainder of the day resting at Top Shelf’s step grandparents’ condo. Yay! I think your blog is the first I’ve ever read that has sun and warm weather in Washington. Other blogs I’ve read show misty rainy near hypothermic conditions! This is just magical. That’s because no one thinks to finish early enough to see it. I tell people all the time to think of that when they take tons of zeros down south. Is it worth missing a great day in Washington?? I got lucky as I was on the late end with the snow delays. You are right. I would take less zeros if possible if it meant more chance of better Washington weather!